To add an Association Class to a Class or Deployment diagram, click on the 'Association Class' icon in the Toolbox. Click and hold on the source object in the diagram while you drag the line to the target element, then release the mouse button. Enterprise Architect draws the connector and adds the Class, then prompts you to add the Class name. Note that the names of the Class and the connector are the same. You can also connect a new Class to an existing Association. You can highlight the Class part of an Association Class in the Project Browser, by selecting the 'Find Association Class' context menu option on the Association connector. This diagram illustrates an Association Class between model elements. Note the dotted line from the Class to the Association. You cannot move or delete this line. 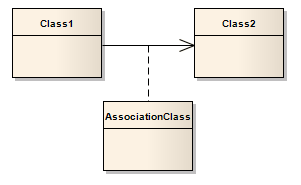 If you dissociate the Class from the Association connector, both parts keep their Shape Scripts until the stereotypes are removed.